tell me how to sew Samsung CLP 315 May 2009 version. is there any method to program clp 315 as for samsung 4300 and ml 1640. If yes, kindly let me know. No. At least I do not know that. I have got a printer clp 315 ver october 2009 OS Ver. 53. As you have suggested will the shorting of legs 7 and 8 reset the cartridges. Kindly let me know. Very urgent. The printer is blocked? If not, you can close the legs 7 and 8. If the printer is blocked, it is necessary to change the firmware. Printer CLP 315 not blocked. Just 10 copies printed on the new printer. Tried to close legs with the help of screwdriver but to no use. The counter keeps on moving ahead. The site you had discussed does not give a clear picture. Kindly give me a good picture with details. Because the legs to short (7 and 8) are not clear. If the cartridges are installed chips, then the jumper will not work. Legs 7 and 8 chips should not short short, and put a permanent jumper. Tried as per your instructions but the printer did not start. Removing the jumper the printer again started. As already said the printer is brand new. Only 10 copies are printed. The cartridges do not have any chip. I had put a jumper on 7 and 8. If any other way out kindly tell me. Very urgent. 7 pin unsolder? It should be in the air! If this fails, then the modification of software on the chip. Only black cartridge was with chip (purchased a new one). 3 colours original came with the printer (without chip) (not exhausted). Did as per your instructions. Funny thing happened. If the chip on black cartidge was blocked the counter worked from the motherboard and when chip was not blocked the counter worked from the chip. Just tell me if this printer will give toner exhausted any time. What to do to reset the counter of black also. Thnks for all the support you are providing. When you disconnect pins 7 and closes it at 8 on the chip, chip on the cartridges should not be. Otherwise, the printer will work buggy. 7 pin unsolder? It should be in the air! You do not answer my questions. I find it difficult therefore to answer you. Sorry, if have ever hurt your sentiments. I answer you as soon as I can. Regarding Ricoh I did not get the printer name. This printer is just having one chip in black. I did not notice this at the time of 7 pin unsolder. 7 is in air and closed it at 8. 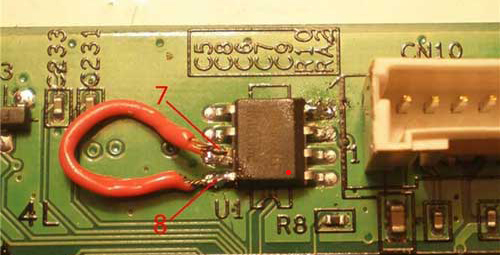 As already said when the chip is blocked (by black electric tape) the couter works from motherboard. The buggy thing is that as soon as I remove the tape from black cartridge chip the counter starts from where left in the chip (not motherboard). Kindly tell me what to do so that I do not have to buy a new black cartridge ? Whether black with give toner exhausted. Thanks and sorry for not answering to you. The method of closure of 7 feet by 8 does not work if the printer were installed cartridges with chips. Even if the chips are then removed from the method of closure of the legs does not work. It had to be done on the new printer. Now just to reprogram the chip in the printer. It was impossible to give the printer to feel the chips on the cartridges. Recently I came to know that fix firmware for clp310/315 is available.